On a near perfect football weather day, the Dalhousie University Tigers finished an incredible perfect season by winning the Moosehead Trophy emblematic of the Atlantic Football League championship. The cliché that defence wins championships was proven again as the Tigers defeated three time defending champs, the Holland College Hurricanes, 29-11, on Wickwire Field. The Hurricanes lone major came on a pick 6 in the third quarter. A few notable football alumni from the 1950’s were there to watch rookie head coach, Mark Haggett’s chargers, capture Dalhousie’s first football championship since 1954, the last Year of the Tiger. Reg Cluney, an all round star performer and future Dal Hall of Famer, captained that squad and was named team and title game MVP in the Purdy Cup, witnessed the win with pride. The pre-game ceremony in the Stewart McKelvey Championship Game honoured the Wilson family. Daughter Kati, last year’s club president set her alarm for 3am and was up watching the game in Australia. Harv the Wilson’s dog and team mascot missed the first half of the game but was around for the post game celebrations. Mom Lisa, the team physio has looked after the players since day one, while DB son Rob, a present team captain and this year’s club president contributed eight points in the title game off of his powerful foot. And then there is chairman Jim who eight years ago was president of the Dal Alumni and on the Board of Governors and thought bringing back football after a 34 year absence would be great for the campus. After a recruitment call to former Dal QB and past FNS president, Rick Rivers, the ball was in the air. Jim’s tireless energy and business acumen have resulted in 2016, being the Year of the Tiger. Of note the Haggett trio, with head coach Mark on tuba and his brothers, Jonathan and Matthew on trumphet, did credit to the music of ‘O Canada. And the ever exuberant Dalhousie University President, Richard Florizone, attended yet another football game. Now from the event to the details of the championship tilt. Having watched game film of the Hurricane’s power run game which eliminated the Red Bombers in the semi-final, the Tigers leading game tacklers, Jack Chaisson, Josh Bordage and Giovanni Holmes kept Holland ineffective. Down, 21-11 in the 4th quarter, the Hurricanes were forced to throw. An interception by Tegin Davis and a late fourth quarter 50 yard pick 6 by Kenzie MacNeil all but sealed Dal’s first AFL title. Dal’s two headed monster, Nick Hunsley’s aerials (22/28-248 yards) and Zack Leger’s diversified running (25/113) were not as productive as usual in the red zone. On two occasions, penalties negated two Tiger TDs. One an exciting 25 yard catch and run by Chad Kirkhus. Hunsley neutralized his major miscue with a perfect sideline ball for a 40 yard TD to Dal’s leading receiver Guillaume Bernier (9/93) in the third quarter. But there were some anxious moments at Wickwire before MacNeil’s major in the 4th quarter as Hunsley lay motionless on the turf. Leger would do well from the wildcat QB position filling in for Hunsley. But the crowd and probably Leger were happy to see the starter return a few plays later as the theme song of Rocky was played on the PA system. The offence had been held to a season low, one TD while the rest of the points came off the foot of Rob Wilson, two field goals and two singles. The defence and specialty teams accounted for one major each. To win a championship at any level is a rare beast but it is even more impressive to go undefeated through a season and post the awesome numbers that our Dalhousie Tigers achieved. Tiger football is sad to see 12 of their own moving on but at the same time the returning players already know that success breeds further success and Coach Haggett has already been actively recruiting to fill those voids. All coaches should be proud of the discipline, skill sets, camaraderie and FUN they instilled with the 2016 champion Tigers. Football is the ultimate team sport and this year’s team achieved the ultimate goal of becoming a strong cohesive caring FAMILY which resulted in Dalhousie’s first AFL Moosehead Trophy. No one can take that away from you and you will relive that unbelievable accomplishment with your peers for the rest of your life! 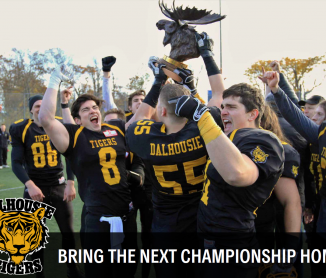 Dalhousie football history has been made and 2016 was THE YEAR OF THE TIGER and we the past and future alumni thank you for your outstanding commitment to excellence in the world’s greatest sport.